With Collars pedigree in making the finest quality wooden yacht masts and oars, it was only a matter of time before our skill were called upon to produce custom made wooden flag poles. Traditional wooden flag poles were originally turned from solid grown timber but, with suitable lengths hard to find along with the associated problems such as drying and rot, laminated poles are ultimately the way forward. With construction almost identical to that of a yacht mast, the wooden flag poles we make are normally of hollow construction saving weight and allowing the pole to naturally expand and contract in the changing weather conditions. Painted white using a marine paint system, they require little maintenance and are custom made to any size, whether replacing an existing pole or installing a flag pole from scratch. More often than not there is a tabernacle arrangement at the foot of the mast to allow the pole to be raised and lowered. The fabrication of a tabernacle is something we can certainly help with if needed. Likewise, the staying of the flag pole together with the installation, is a service we are pleased to offer and can provide an estimate on request. Over the years, commissions have included celebratory birthday poles, small church roof poles up to a large Naval Base requiring a 60' timber flag pole together with a yard arm. 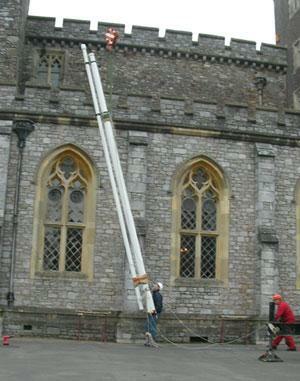 So whether your flag pole is for a garden, a golf club or castle we will be pleased to offer our services and advice.